Dominic Flandry is an agent with the Intelligence Corps. This organization is part of the Navy and is responsible for gathering data that is vital for the successful completion of its mission and the mission is the protection of the vast Terran Empire. The adventures that make up the history of this highly decorated and resourceful operative take place in the 31st century. Hundreds of years before, the people of Earth, now calling themselves by the Latin name of Terra, had acquired the ability of space travel and millions had left to find and colonize planets all over its galactic neck of the woods. Eventually they would encounter other intelligent life, many humanoid and some not so much. And eventually these would join in the confederation, many willingly and again some not so much. In the time of Flandry's service, the Terran Empire had unfortunately seen far better days and its rule was waning. Entropy, that inevitabilty that comes to all people and all organizations, was rife. Flandry, for all his devotion and dedication to maintaining security for his government, knows the end is coming. What he refers to as the "Long Night" which is sure to follow will see the myriad worlds experience the same Dark Ages that the world saw with the fall of the Roman Empire. He just hopes that with his help it might not come during his lifetime. In the many reports we have of Flandry's adventures, we follow him from a very eager but "wet behind the ears" Ensign graduating from the Academy and being assigned to the Intelligence Corps. Earnest and eager and quite smart and capable, he is still young and prone to rash decisions. Luckily he survives and learns and grows and gets far better. He will advance in rank and prestige and privilege as he successfully completes one mission after another until he achieves the position of Admiral and holds the title of Knight, friend to Emperor and other powerful leaders. Along the way he will use brinkmanship and bravado and cunning and deviousness to meet the challenges of his tasks. He can be, as the situation demands, forceful and commanding or obsequious and fawning; his keen intellect and ability to read people of all races and species letting him know whether it is time to bow low or punch hard. And also along the way, like any good agent, he will learn how to enjoy the many different pleasures that the thousands worlds in the Empire have to offer. He becomes a connoisseur of good drink, great food, beautiful women, and so on. All the while fighting the good fight to stave off just a bit longer the "Long Night" that is coming. 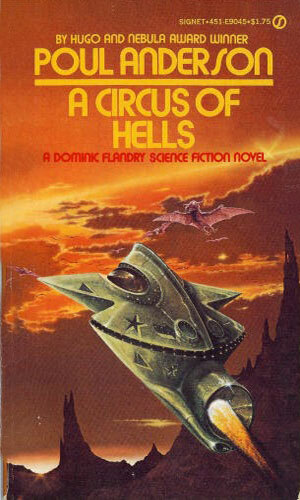 Science Fiction stories really came into their own in the late 40s and early 50s. There were, of course, oodles of tales before then, many darn good and worth savoring, but for me, and it is important to remember this is all IMHO the Golden Age came when the giants strolled the literary world. Asimov, Heinlein, Sturgeon, Clarke, Lem, the list just goes on and on. On that list has to be the name of Poul Anderson. How he came up with the idea of a spy in space before spies became popular is unknown and very impressive. I read years and years ago a comment comparing Flandry to a gunslinger in the Old West who rides into town and cleans up the streets and rides out again and I remember screaming silently, "No!" That is too blatant for Flandry. He was a whole lot more devious. Sure, he could pound it out with bad guys if needed but he slipped in through the back figuratively far more often than he walked through the saloon's swinging doors. Over the years as the author aged and perfected his already terrific skills, the character would age as well but he would always be Flandry - solid, devious, intelligent, duplicitous. And his roving eye would never pass over a beautiful lady without noticing. My kind of character. 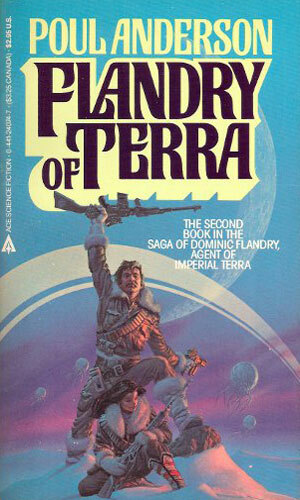 The first Flandry book I found back in the day was not a novel like I thought it would be but a collection of stories. The second book was also a collection. 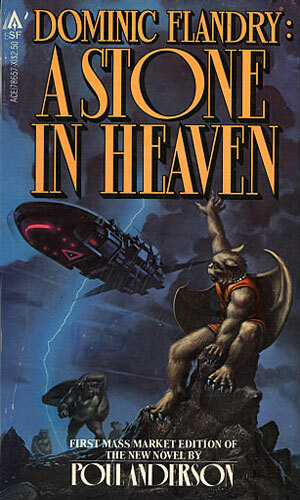 It was not until the third title came out that a full novel was presented. After that, several more books would be published, a couple of which had their start as a short story or novellette or novella and then get expanded to be a novel. The last Flandry adventure was released in 1985. The author would go on to pen numerous other tales, some in the terrific Time Patrol series, but Flandry's story, it seemed, had been told and he was left to rest in peace. 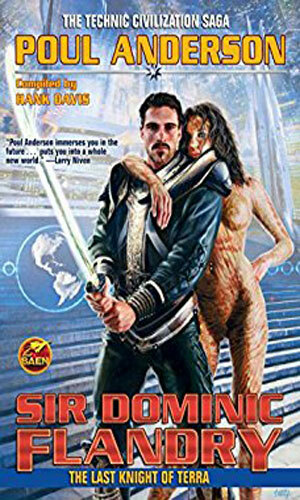 Almost a decade after the author passed in 2001, the worlds of Dominic Flandry have been brought back to the new generations of readers in omnibus formats with all the stories again available physically and electronically. I strongly recommend them. Long before he would make a name for himself in the intelligence service of the Terran Empire, 19-year old Dominic Flandry is fresh out of the Naval Academy, wet behind the ears and excited about his future. Dominic Flandry is now an Lieutenant. Based on the planet Irumclaw, he allows himself to be bribed (he has other motives) to search for a moon called Wayland with valuable heavy metal available. To aid, he asks for the help of a female agent. 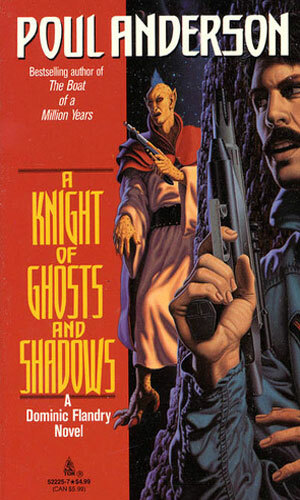 This novel incorporates the novella The White King's War. It is part of the collection Young Flandry. With the rank of Lt. Commander, Dominic Flandry is given command of a warship, the Asieneuve and sent to investigate the Alpha Crucis Sector. The region's governor is known to be corrupt but when a Fleet Admiral tried to report on him, the admiral was arrested. Now broken out of prison, the admiral is leading a rebellion. Flandry's allegiance is torn. Contained in the omnibus Young Flandry. With the death of one emperor and the assumption of power by a new one, civil war is breaking out in numerous parts of the Empire. Now holding considerable power and privilege, Dominic Flandry goes to one particularly volatile region where the rival Merseian Empire is causing trouble. A noted scientist, in charge of a research project on a planet experiencing a new ice age, has asked for help saving the planet. She appealed to Grand Duke Cairncross, in charge of that sector, but he has his reasons for refusing. When she heads to Earth to seek out now Admiral Flandry, she embroils him in a nasty mess. A daughter of Dominic Flandry, Diana Crowfeather, possibly unknown to her father, is on a planet where the seeds of new rebellion are growing strong. She will be a part of a huge tapestry of war as the Empire begins to collapse. 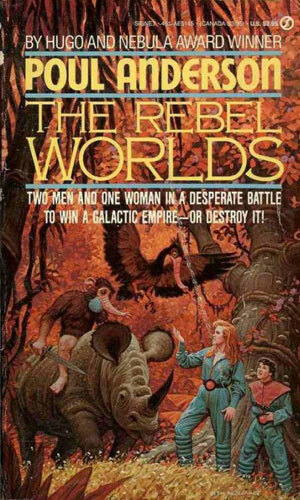 Omnibus containing the three novels Ensign Flandry, A Circus of Hells, and The Rebel Worlds. Omnibus containing several short stories set in the time of Dominic Flandry. First appearing in Planet Stories, Jan 1951. Captain Dominic Flandry has been kidnapped and hauled to a planet belonging to the Scothani, a small empire outside the Terran Empire and one that is hoping to conquer the bigger realm. As his captures make him a slave to extract as much intel as they can, he assumes the role of advisor to corrupt from within. Contained in the collection Agent of the Terran Empire. First appearing in Future Combined With Science Fiction Sories, May 1951. The Betelgeuse System is in the buffer zone between the Terran Empire and the Merseian. Dominic Flandry is attending a reception on one of the planets to try to sneak in the a Merseian quarters to learn info but an enemy agent, Aycharaych, has other plans. Contained in the collection Agent of the Terran Empire. First appearing in Planet Stories, Summer 1954. On furlough at his home on the planet of Varrak, Dominic Flandry is quite upset when he learns a raiding party has struck a major city and carried off an assortment of women, one of which is the granddaughter of the current Empire. Contained in the collection Agent of the Terran Empire. First appearing in Venture Science Fiction Magazine, Mar 1958. Now a Knight, Dominic Flandry learns of some nasty goings-on at the planet of Nyanza where a local civil war is brewing. Contained in the collection Flandry of Terra. 5 We Claim These Stars! First appearing in as an Ace Double. A wolf-like race called the Ardazirho, previously unknown to the Terran Empire, has attacked a human world. Dominic Flandry is ordered to head there to learn more of the new enemy. Contained in the collection Agent of the Terran Empire. First appearing in Amazing Science Fiction, Jun 1959. Expanded to become We Claim These Stars!. First appearing in Fantastic Science Fiction Stories, Dec 1959. A previously unknown human colony on the planet of Altai, which lies between the Terran and Merseian Empires, is being pulled by both to join them. Dominic Flandry is sent there to tip it in his direction. Contained in the collection Flandry of Terra. First appearing in Fantastic Stories of Imagination, Dec 1960. Hearing of yet another unknown human planet in the Betelgeuse System, Dominic Flandry heads to investigate and finds a planet whose air is filled with poisonous bacteria. The residents must take a pill provided by a company called Biocontrol and that company wants to keep it that way. Contained in the collection Flandry of Terra. First appearing in Galaxy Magazine, Aug 1969. This tale would be expanded into the novel A Circus of Hells. Imagine a spy who has exquisite taste in food and drink, loves the ladies and they definitely adore him, can fight with the best of them, and knows a thing or two about games of chance. Yes, we are all thinking of J.B. and we might not be far off. Except ... let's move this intrepid operative over a thousand years into the future for his adventures. And ... let's have his first exciting mission be written two years before Fleming released his agent onto the publishing world. 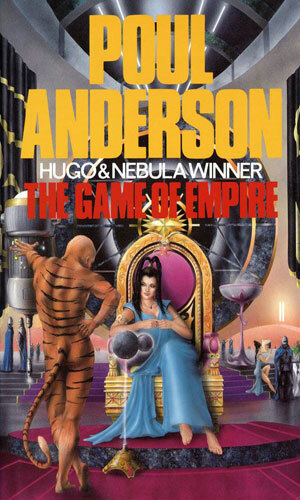 I was introduced to Poul Anderson in the earl 70s through a couple of books in his Polesotechnic League series, most of which dealt with an enterprising merchant and soon-to-be magnate. Then, thinking I was still in the same time period, I grabbed the collection of stories, Agents of the Terran Empire, and went 'huh?' and then 'wow!' I loved it. I then grabbed the second collection and enjoyed the daylights out of it as well. 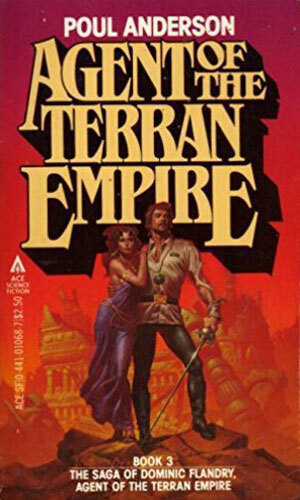 When I got the first real novel in the series, Ensign Flandry, I was less than thrilled because I hate going back in time (even when dealing with the future). I was young then and didn't know a good thing when I read it. 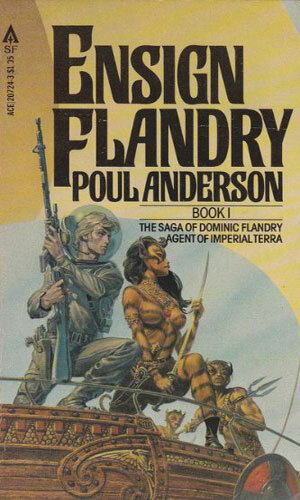 As the years passed, my interests moved to the spy-fi realm and I did not read any more of the Flandry novels. I should have but "so many books, so little time!" When I started this compendium, I limited my sphere to books WWII-to-present. I was asked a couple years ago if I would consider Dominic Flandry and I demurred. Outside my scope, I said. Then a while back I decided to extend my focus to, well, everywhere. The same person who once asked about Flandry and was told now was kind enough to send another email and ask, "hey, remember when I ..." It took me about 5 seconds to reconsider and respond, "oh, heck ya!" That wonderfully required that I pull my very dusty copies of the Flandry books from the shelves and go back to the 70's by leaping forward to the 31st Century and some incredibly awesome spy adventures told by a true master of this craft. And his craft was not just science-fiction. It was literature.